A toll for people walking and biking across the Golden Gate Bridge will be considered for study tomorrow by the Golden Gate Bridge Highway and Transportation District’s Board of Directors. The SF Bicycle Coalition is calling on sustainable transportation advocates to oppose the fee, calling it an tired idea that would discourage walking and biking. GGBHTD General Manager Denis Mulligan said on the forum that the board will merely consider approval of a packaged “work plan” with 45 budget proposals to study [PDF], including the tolls on biking and walking. He said the study would look at the potential impacts of such fees, like lines of people waiting to get on to the bridge, as well as possible discounts for locals. “Like any topic, people have differences of opinion — some members of the community feel that it’s appropriate, and some feel that it’s not,” said Mulligan. Almost every forum listener who called in or commented online blasted the idea. The Bridge District needs to close a $32.9 million five-year deficit and a $209.8 million 10-year deficit, according to the SF Chronicle. As we’ve reported, the district has hiked Golden Gate Transit fares much faster than it’s raised tolls on drivers, although it did approve a toll increase in March. As Shahum pointed out, tolling pedestrians and bicycle riders will not only serve to discourage walking and biking while encouraging driving, but also just doesn’t make sense given that wear on the bridge is exponentially related to a vehicle’s weight. A toll of $6 on a typical car should translate to a bicycle toll of $0.00016, if the toll was levied to recoup the cost of wear and tear. The Golden Gate Bridge Board will consider the fee study at its meeting tomorrow at 10 a.m. at the Golden Gate Bridge Toll Plaza, where the public can weigh in. The SFBC also has an online petition to sign. Please don’t give the DRPA or the PA of NY/NJ any ideas! The most annoying thing to me is this. Pedestrians and cyclists will be expected to pay a toll, but not get the requisite coddling treatment that drivers currently get. Pedestrians and cyclists have to share one narrow side of the bridge during weekdays. When cyclists use the other side of the path, the pathway is frequently narrowed by porta potties, and repair equipment. The metal plates over the bridge expansion joints are poorly done and can be slippery when wet, and given that the bridge pretty much lives in a fog bank this is the majority of the time. The access to the west side path is via a pathway with a hairpin uphill turn that is poorly paved and frequently torn up by tree roots. The exit to from the pathway dumps you unceremoniously through a fence into a parking lot. When there is a jumper on the bridge, the pedestrian walkway shuts down – but the roadway stays open of course! 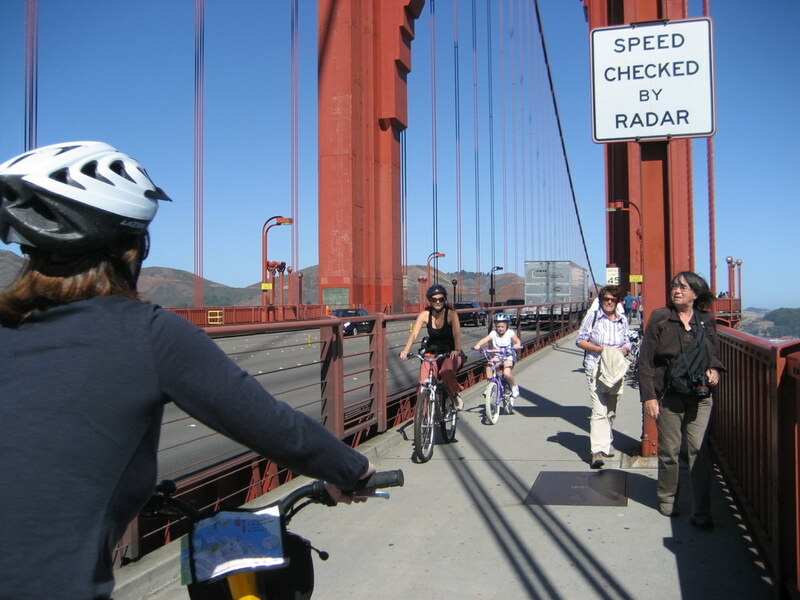 One could say that the cyclists should just be aware of these issues and be careful on the bridge instead of expecting the GG Bridge district to invest money to make the pathway safer, even with the toll. But if one says that, why exactly is the bridge district investing 30 Million dollars – conveniently the same as their projected deficit – to build a movable hard median on the bridge when that problem can be simply solved by drivers being more careful? I wrote a blog post on this exact topic today. There’s a lot that can be done! This isn’t the only way. You forgot about the chicanes. Just once I’d love to see cars negotiate a U-shaped obstacle with 2-way traffic, right in the middle of the GGB. Excellent points. I’d also add (from past experience) that the west sidewalk occasionally would be unlocked considerably later than its scheduled 3:30 pm time (on weekdays). The Bridge District employee would explain that staff had been busy attending to another matter, hence the delay. My impression from this was it’s okay to delay a bicyclist’s commute… as the cars whizzed by. Of course the bike lanes are frequently blocked by port-a-potties and other construction equipment, the sidings are required for maintenance and emergency access whether bikes are using them or not. In fact the only real bike facilities it seems the Bridge authority wouldn’t have to be maintained anyway is that hairpin turn, and even then they’d probably still want or need it as a backup underpass to the tunnel. So what exactly is it we’re being asked to pay for here to ride a bike? Is one of the traffic lanes going to be converted to a bikeway? 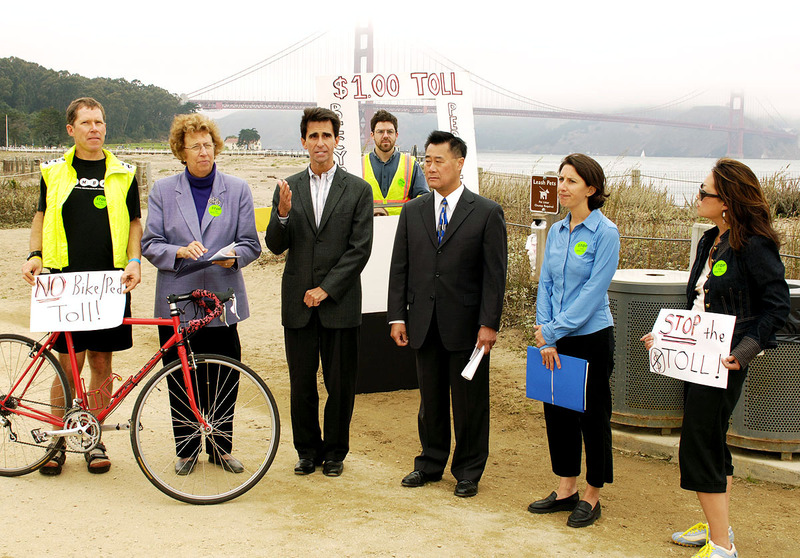 The GGBHTD should have been merged into the Bay Area Toll Authority. The District retired its bonds in the early 1970s and now offers no added value to the Bay, especially when a less myopic agency could easily administer the bridge and do so in accordance with regional priorities. This entity already cut cost by eliminating toll takers, even though it compromises customer service. A toll on ped and bikes will likely require some form of additional labor, either similar to BART gated system, or proof of payment. They do run a transit system using some of the toll funds, which ain’t nothin’. 4 members from SF are from the BoS, 4 are elected by the BoS. Those 8 members voted not to study the toll. The one member who voted for the study – John Moylan – was appointed by Mayor Newsom and reappointed by Mayor Lee. Shocking. My point was that it’s really redundant to have two toll authorities, let alone 27 different transit agencies. Given recent labor strikes, excessive fare increases (as compared to auto tolls), and basic service (often 1/2 to 1 hour headways), I think some other entity could do a better job. How about BATA for tolls, WETA for ferries, and perhaps Marin Transit for the buses. If the GG Bridge District is hard up for money, they should put meters in the Vista Point and Toll Plaza parking lots. It is clear they are only going to study one of more than 40 budget-impact proposals. There is nothing wrong studying far-fetched measures, just to evaluate their impacts and bring ideas for the agency managers to brainstorm about. To oppose a mere study is just unacceptable, remembers of the instances where politicians, not wanting to ever risk some idea they don’t like come to fruition, put poison pills on legislation that explicitly prohibits even study of certain controversial measures. I don’t like the “twist” many of the news regarding transportation on Bay Area are getting for the last couple months on Streetsblog SF. Somehow along the pamphlet tone of many articles was pushed up, and quality of reporting compromised by “activist-writing” style.